Will the bus really travel to my house just to pick up one person? Do I need to meet the bus at a bus stop? Can anybody use the service? Can I use the bus to get to an appointment at the East Surrey Hospital ? Can the bus be booked for group outings? 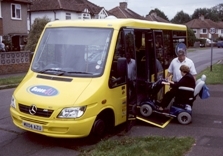 Is the minibus accessible to wheelchair users? Yes! The demand responsive service will travel to where ever a customer has booked from, even for just one person. If you can arrange to travel at the same time as your neighbours or friends even better; but if this is not possible it is perfectly acceptable to book the bus for one. If there is another person travelling from your area when you make your booking the travel centre may ask you if you can travel earlier or later to combine the two bookings. All individual journey requests must be made at least 1 hour before you wish to travel. You may book upto 7 days in advance and the more notice you can give and the more flexible your timings, the more likely your journey can be accepted. All bookings are made on a first come first served basis. Please see the section on fares for information on prices in your Buses 4U service area. In some areas an annual membership fee applies. Please see the section on membership below. Only on some services. For full information follow the Buses 4U Membership link above left or click here. Yes, you may use Buses 4U to get to an appointment at the East Surrey Hospital. Yes. Group outings can be made to anywhere within the area of service. This could be for an organisation or just a group of friends that wish to travel together. To book please call the Travel Centre stating the number of people wishing to travel. Outings to destinations not more than half an hour from the area of service may also be considered dependant upon the number of people travelling. Please contact the ESRTP if you would like to discuss a possible outing. Please note that in areas of service where membership is required, all persons within the group should be members. Yes. The buses have a passenger lift at the rear of the vehicle. All the buses have webbing and restraints to make sure your wheelchair is secure and ensure your safety whilst travelling. It is recommended that you advise the travel centre that you are a wheelchair user, just in case another wheelchair user has booked at the same time as you. All the buses have space for one wheelchair user but more can be accommodated if the travel centre is advised.